Granny flats have recently become an affordable way to increase your rental yields and ROI. 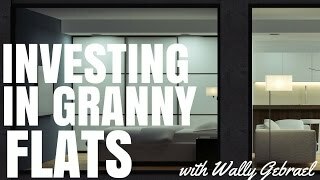 Both home owners and investors are jumping on the granny flat band wagon and today I sit down with Wally Gebrael from Granny Flat Solutions to discuss investing in granny flats in more detail. Investing in granny flats can be a great way to increase your rental yield and maybe even turn a negatively geared property into a positive cash flow property spinning off passive income for you. Today I sit down with Wally Gabriel from GrannyFlatSoulutions.com.au. His company builds granny flats, 80 to 100 per year. I talked to him about the benefits of having a granny flat and we also talk about what expenses are were looking at and build times and so forth. Wally has a wealth of knowledge about granny flats, both the home owners and for investors so let’s head over to the interview right now. So adding a granny flat too your home or investment property…. There are numerous reasons or benefit of building granny flats so it’s not typically for just granny so to speak. Many investors as you suggested have jumped on board looking at this sinking G’s. We do have an investment property that’s got large backyard in there which is doing nothing for us. It’s a great way to increase the capital growth of the property at the same time generate more income. So it’s you know the double when we ****. It’s quite a good investment in that sense. Apart from property investors you got your moms and dads who I guess is some respect is’s like some investment where they are trying to generate some income from the backyard or building it for the kids who might get in that age when they are about to get married it’s some way to start off for them. You’ve got, again you have your traditional grannies or in-laws that*** that want to work, live in there close to mom and dad. And finally home offices seem to be other large trend were finding people doing the take advantage of it and doing granny flat as a home office where they don’t have to pay exuberance rents and things like that. They can work from home which most people can’t do these days with technology. So yeah they are doing quite a few benefits in that why are people doing granny flats. I will give you a couple scenarios that will probably help to explain it better. When you look at the western suburbs of Sidney or of Blacktown, those areas… a typical granny flat will get you 350 a week. If you look at the main residence in the house…. Granny flat would be two bed and one bathroom reinvesting, that’s getting a 350 a week. The main residence depending on how large it is and the condition and so on. One average is getting probably 350 to 400 a week. So that’s she pretty close, you got smaller house but you potentially get the same if not better and I can’t say there have been times when granny flats has ended up getting more rent than the main residents because maybe a half had be run down and if it is a granny flat is quite new and modern…a lot of content in there so they can’t*** more than main house. Then you look at sort of on Northern Beaches, eastern suburbs, you are looking at $600 per week. It’s not because the building is that much more flat but just because the location. Generally speaking for a typical two-bedroom, when I say typical I mean concrete slab, vinyl clad walls, concrete roof and a relatively flat block of land, you are looking roughly around 105 to at least say 105-110, 000. That will include all your design costs, your approvals, certification or your separate major about properties or your service connections and so on. So it’s radius from about 105, 110- a typical block. There is some cases where the site might have some constraints like access issues or it might be quite hilly lots of rock, things like that. Obvious that that would affect the price. Worst case scenario and worst case we’ve ever had to go to has been about $150,000 on a*** site. The construction time is around 10 to 12 weeks so 10 weeks would be a stand, easy access site, quite level, no rule constraints, getting in and out in about 10 wakes. 12 weeks is sort what we are allowed for, something if you had a bit more access issues where everything had to be delivered to the front and hand-picked take it to the back *** a bit more time. But yeah an average good we got 10 to 12 weeks. Wally: We’ve been in contact with, we’ve been trying to get in contact with the real estate institute in New South Wales you to get some more data because technically the granny flats have been around for a couple of years said so the amount of sales of properties with a granny flat are not huge so it’s really hard to work that out. However we do have a lot of investor clients who do get their properties revalued once they finish so they can refinance and move on to another property. And the trend that we’ve seen has been that you get on average dollar for dollar for an investment. So for example you spend a $100,000 to build you now *** some tomorrow, you get your $100,000 back. Now that’s what we seen in many areas. In some areas it may be slightly higher but again not that many people have had that valuation done to verify that. But the ones we have seen have certainly be a dollar-for-dollar in terms of investment. In 2009 state government you said ** decided that by allow people to build granny flats it would I guess encourage or provide more affordable housing and provide the *** affordable of housing. So that was a intention initially, to create affordable housing and that’s where all kicked off in 2009 and since then people are jumping on board and trying to get advantage of it. The way we structure our payments is that everything is done, every progress claim that we put forward to a client is usually done after our stage of work. For example apart from the initial fob 5% deposit *** to come up with. Every invoice we send after that point until completion is after the stage of works, for example after the complex labs is done, after the frame is done and so on. The reason we do this is that we know that most banks would want to some banks want to check works or get the client’s approval before they release funds so they don’t want to the week *** invoice for the slab the bank would need the client’s approval to release funds and if this lab wasn’t done then obviously they wouldn’t approve, the payment would be drawn. So that’s how we structure our payments everything is done in stages and for the clients piece of mind, they get invoiced after works are done not beforehand. People are funding these granny flats out of existing equity in their property or they are getting construction loans in order to finance and build the granny flats.It’s a mixture of both I’d say but predominately most people use the equity in their own homes. As you said it’s definitely a free Quot. So we normally we ask client to send trough soon *** their property and they get nice certificate which outlines all the planning, restrictions on their property, then we go out there free assessment and take it from there. Yes it’s a simple as that. So if you’re in New South Wales get in contact with Wally and consider getting a granny flat built in your property. Well as you can see it is so easy now to build a granny flats especially in New South Wales. And obviously there’s chances to build granny flats in other states as well. The question then is why wouldn’t you do it? just a quick disclaimer, none of this was financial advice, it’s for educational purposes only but hearing the figures, talking about rental incomes of $300 or $600 per week on a granny flat which is probably only going to cost $105,000. The gross rental yield over $600 per week property that only cost you a $105,000 to build is somewhere in the vicinity of 30%. These are figures that we really only see in the US market so seeing them in Australia using granny flats is very exciting and something that I am looking forward to hearing more about.